Furnish and install flexible membrane lining in the areas shown on the drawings. All work shall be done in strict accordance with the project drawings, these specifications and membrane lining fabricator’s approved shop drawings. Geomembrane panels will be supplied sufficient to cover all areas, including appurtenances, as required in the project, and shown on the drawings. The fabricator/installer of the liner shall allow for shrinkage and wrinkling of the field panels. The fabricator of panels used in this work shall prepare shop drawings with a proposed panel layout to cover the liner area shown in the project plans. Shop drawings shall indicate the direction of factory seams and shall show panel sizes consistent with the material quantity requirements of 1.01. 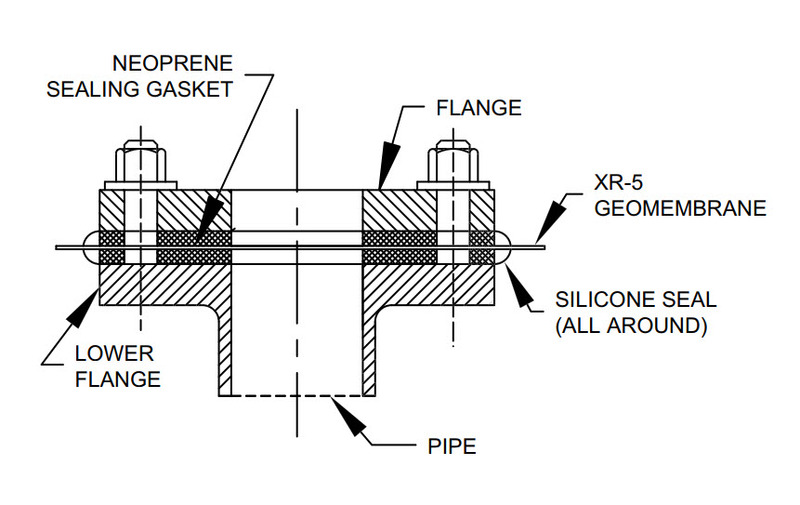 Details shall be included to show the termination of the panels at the perimeter of lined areas, the methods of sealing around penetrations, and methods of anchoring. Placement of the lining shall not commence until the shop drawings and details have been approved by the owner, or his representative. The individual XR-5® liner widths shall be factory fabricated into large sheets custom designed for this project so as to minimize field seaming. The number of factory seams must exceed the number of field seams by a factor of at least 10. A two-inch overlap seam done by heat or RF welding is recommended. The surface of the welded areas must be dry and clean. Pressure must be applied to the full width of the seam on the top and bottom surface while the welded area is still in a melt-type condition. The bottom welding surface must be flat to insure that the entire seam is welded properly. Enough heat shall be applied in the welding process that a visible bead is extruded from both edges being welded. The bead insures that the material is in a melt condition and a successful chemical bond between the two surfaces is accomplished. 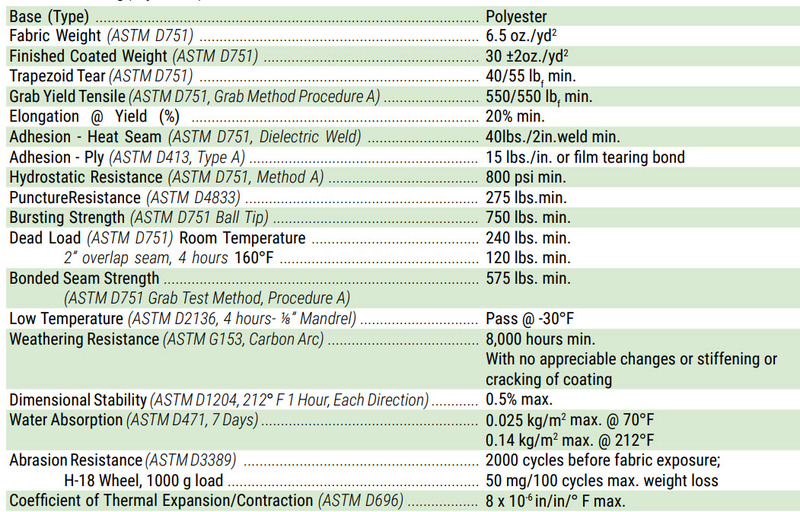 Two-inch overlapped seams must withstand a minimum of 240 pounds per inch width dead load at 70° F. and 120 pounds per inch width at 160° F. as outlined in ASTM D 751. All seams must exceed 550 lbs. bonded seam strength per ASTM D 751 Bonded Seam Strength Grab Test Method, Procedure A. The fabricator shall monitor each linear foot of seam as it is produced. Upon discovery of any defective seam, the fabricator shall stop production of panels used in this work and shall repair the seam, and determine and rectify the cause of the defect prior to continuation of the seaming process. The fabricator must provide a Quality Control procedure to the owner or his representative which details his method of visual inspection and periodic system checks to ensure leak-proof factory fabrication. Prior to installation of the panels, the fabricator shall provide the owner, or his representative, with written certification that the factory seams were inspected in accordance with Section 1.05. Factory fabricated panels shall be accordian-folded, or rolled, onto a sturdy wooden pallet designed to be moved by a forklift or similar equipment. Each factory fabricated panel shall be prominently and indelibly marked with the panel size. Panels shall be protected as necessary to prevent damage to the panel during shipment. Panels which have been delivered to the project site shall be stored in a dry area. The fabricator of the lining shall be experienced in the installation of flexible membrane lining, and shall provide the owner or his representative with a list of not less than five (5) projects and not less than 500,000 square feet of successfully installed XR-5 synthetic lining. The project list shall show the name, address, and telephone number of an appropriate party to contact in each case. The manufacturer of the sheet goods shall provide similar documentation with a 10 million square foot minimum, with at least 5 projects demonstrating 10+ years service life. The installer shall provide similar documentation to that required by the fabricator. Lining installation shall not begin until a proper base has been prepared to accept the membrane lining. Base material shall be free from angular rocks, roots, grass and vegetation. Foreign materials and protrusions shall be removed, and all cracks and voids shall be filled and the surface made level, or uniformly sloping as indicated on the drawings. The prepared surface shall be free from loose earth, rocks, rubble and other foreign matter. Generally, no rock or other object larger than USCS sand (SP) should remain on the subgrade in order to provide an adequate safety factor against puncture. 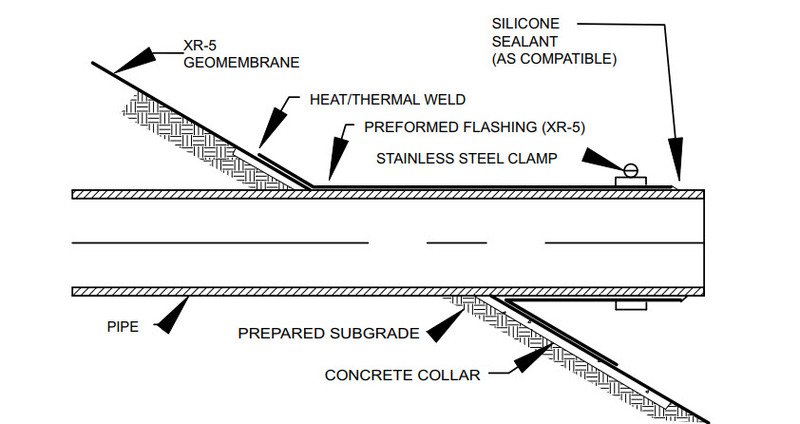 Geotextiles may be used to compensate for irregular subgrades. The subgrade shall be uniformly compacted to ensure against settlement. The surface on which the lining is to be placed shall be maintained in a firm, clean, dry and smooth condition during lining installation. Prior to placement of the liner, the installer will indicate in writing to the owner or his representative that he believes the subgrade to be adequately prepared for the liner placement. The lining shall be placed over the prepared surface in such a manner as to assure minimum handling. The sheets shall be of such lengths and widths and shall be placed in such a manner as to minimize field seaming. In areas where wind is prevalent, lining installation should be started at the upwind side of the project and proceed downwind. The leading edge of the liner shall be secured at all times with sandbags or other means sufficient to hold it down during high winds. Sandbags or rubber tires may be used as required to hold down the lining in position during installation. Materials, equipment or other items shall not be dragged across the surface of the liner, or be allowed to slide down slopes on the lining. All parties walking or working upon the lining material shall wear soft-sole shoes. Lining sheets shall be closely fit and sealed around inlets, outlets and other projections through the lining. 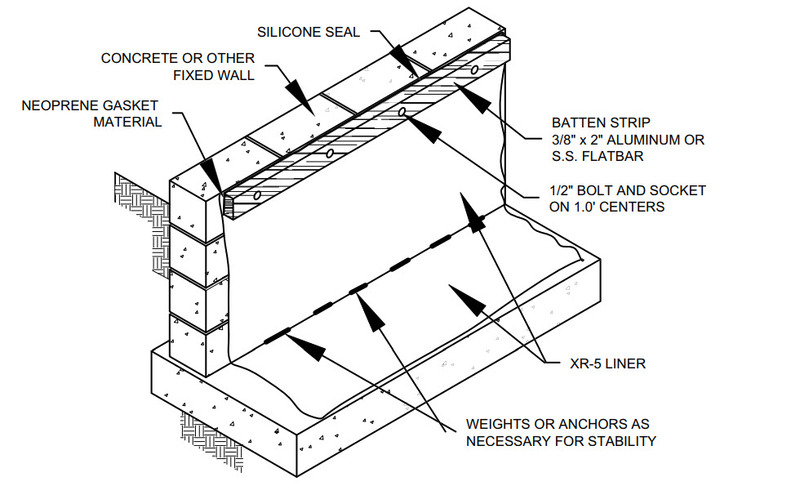 Lining to concrete seals shall be made with a mechanical anchor, or as shown on the drawings. All piping, structures and other projections through the lining shall be sealed with approved sealing methods. All requirements of Section 1.04 and 1.05 apply. A visible bead should be extruded from the hot air welding process. Field fabrication of lining material will not be allowed. All field seams will be tested using the Air Lance Method. A compressed air source will deliver 55 psi minimum to a 3/16 inch nozzle. The nozzle will be directed to the lip of the field seam in a near perpendicular direction to the length of the field seam. The nozzle will be held 4 inches maximum from the seam and travel at a rate not to exceed 40 feet per minute. Any loose flaps of 1/8 inch or greater will require a repair. Alternatively all field seams should also be inspected utilizing the Vacuum Box Technique as described in Standard Practice for Geomembrane Seam Evaluation by Vacuum Chamber (ASTM D 5641-94 (2006)), using a 3 to 5 psi vacuum pressure. All leaks shall be repaired and tested. All joints, on completion of work, shall be tightly bonded. Any lining surface showing injury due to scuffing, penetration by foreign objects, or distress from rough subgrade, shall as directed by the owner or his representative be replaced or covered, and sealed with an additional layer of lining of the proper size, in accordance with the patching procedure. Any repairs to the lining shall be patched with the lining material. The patch material shall have rounded corners and shall extend a minimum of four inches (4”) in each direction from the damaged area. Seam repairs or seams which are questionable should be cap stripped with a 1” wide (min.) strip of the liner material. The requirements of Section 1.11 apply to this cap stripping.